Dear Readers: We’re operating on a slightly modified schedule this week and next. There will be no Crystal Ball on Thursday, Sept. 29, but we’ll be back with a special issue on Monday, Oct. 3. The first debate is over! At least everyone survived. If you’re confused about who’s up and who’s down in this crazy presidential contest, you’ve got plenty of company. Almost hourly now, the political community is being bombarded with new national and swing state polls — and few of them agree with one another. More than ever before, the assumptions pollsters make about the composition of the likely voter pool helps to determine the trial-heat numbers we see. As always, we urge you to avoid the temptation to cherry pick the surveys that give good news for your candidate. Instead, go to RealClearPolitics and HuffPost Pollster and check out the ever-evolving poll averages for the national race and especially all the swing states. It is dangerous to offer confident predictions of how the public will react to a debate immediately after it is concluded. The instant polls you may see (or may have already seen) after the debate declaring one of the candidates the winner may or may not be meaningful, and in order to fully assess the impact we’re probably going have to wait until the end of the week, when new national and state polls will assess how the two candidates’ performances changed the race. It’s no fun to urge patience — but we think that’s better than making sweeping pronouncements in the aftermath of a widely-watched national event that voters may interpret quite differently than experts may expect. The pundit consensus seems to be that Hillary Clinton “won,” but we all know how many times Donald Trump has been counted out, only for him to endure. We also know that Clinton and Trump are talking to two very different countries, and political analysts and reporters are generally in the country Clinton, not Trump, inhabits. However, Trump faces many questions about his qualifications for the job and his temperament, and we don’t believe he did much to provide satisfactory answers to those concerns. Perhaps enough voters want change so much that they are willing to overlook their reservations. Keep in mind that people can judge X as the debating winner, yet stick with candidate Y. Most people tune into debates to cheer for their side; win or lose, they’ve made their choice. According to the NBC News/Wall Street Journal poll, only about 11% of those watching were “debate persuadables” — voters who might really switch sides (perhaps from a third-party contender to Clinton or Trump). We’d bet even most of that group will end up where their partisan identification leads them naturally. Before the debate, there was much reporting about Clinton’s preparation versus Trump’s — Clinton spent much more time on it while Trump stayed out on the trail. Trump’s lack of preparation showed, and here’s an example: During a discussion on cybersecurity, Trump failed to bring up Clinton’s use of private emails as a potential cybersecurity issue. That was the equivalent of “missing the biggest, easiest softball lobbed right down the heart of the plate,” as our Twitter pal @EsotericCD put it. It seemed to us that Trump spoke for a bit longer than Clinton, though as we’re publishing this we did not see an official breakdown of the amount of speaking time. Typically, talking more might be good for a candidate, but in this campaign we’re not so sure. We recently wrote that there’s at least some indication that the candidate who gets more attention in this campaign tends to suffer in the polls. What this debate and the ones upcoming can do is excite the party base, especially if party voters believe their candidate had a particularly good night. Money can be raised and volunteer activity can intensify. Often, however, the polling bump registered for a “winning” candidate disappears within a week or 10 days. Then the race is pretty much back to where it was. Heading into the debate, the race was getting very competitive. New polls released over the weekend and on Monday were generally good for Trump as he tries to catch up to Clinton, whose big post-convention lead has virtually evaporated. Several polls of Colorado now show the Centennial State to be close to tied, and Trump got some of his best polls in Pennsylvania the last couple of days, although Clinton was generally still leading by a couple of points. National polling averages point to a Clinton lead of just about two or three points, if that. Clinton’s floodgates are creaking. This debate might not ultimately make much difference, but if it re-energizes Democrats after weeks of sagging enthusiasm, that will be a victory for her campaign. If it does not, she might be in quite a bit of trouble. Some Democrats are increasingly arguing that the polls are showing too Republican of an electorate and that samples are too white or not showing enough Democratic-leaning nonwhite voters. That may be true, but poll complaints often don’t amount to much (although we do think many pollsters have a lot of trouble getting accurate numbers for Hispanics, a critical voting bloc in many key states). And the high number of undecideds and third-party supporters — about 15%-18% in polling averages nationally, combined — leads to more uncertainty. One trend worth watching is whether Libertarian Gary Johnson could be fading, as is often the case for third-party candidates. Johnson was at about 9% in the RealClearPolitics average as of mid-September, but he’s down to 7% now (the HuffPost Pollster average, which is less sensitive to the most recent polls, also showed him dropping a little over a point in the same timeframe). This may also be the result of a near-complete shift to likely voter polls, which may be removing some registered voters who are backing a third-party candidate as a none-of-the-above choice. A third-party swoon could boost both candidates — Johnson’s decline in a recent ABC News/Washington Post poll seemed to benefit Trump almost entirely, boosting him from 41% two weeks ago to 44% over the weekend while Clinton stayed at 46% and Johnson fell from 9% to 5% — but, overall, Clinton seems to do better in two-way polls rather that four-way ones, so she appears to have more to gain from the third-party voters coming home. While polls tend to indicate both Clinton and Trump voters have largely made up their minds, third-party voters seem far less certain of their choice. As the stakes rise and Republicans increasingly fear a Clinton presidency and Democrats increasingly fear a Trump one, we may see even greater party unity and more defections from the third partiers. So where is this presidential death match? Much closer than anticipated, for sure, but with Clinton maintaining a slight lead in both the popular vote and the Electoral College. Yet she has little room for error, quite a change from the multiple pathways to 270 that she had just a month ago. 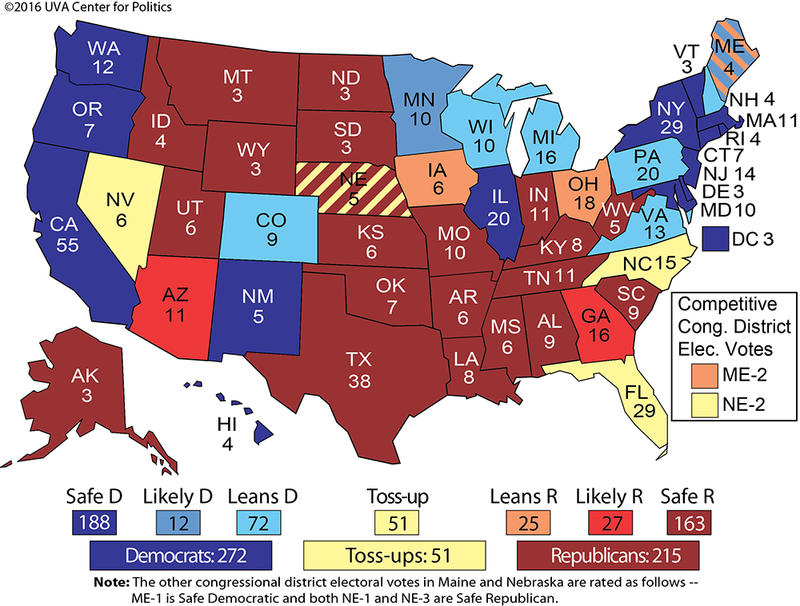 Clinton cannot afford to lose any of the Democratic base states (such as Pennsylvania), and she needs to hold on to Colorado and other leaning Democratic states (or win one or more of the current toss-ups: Florida, Nevada, and North Carolina). We have her uncomfortably close to the minimum (she’s got 272 now), while Trump may be leading in states or districts that would give him 266. Will the Clinton fade continue, or has she arrested that with a solid debate performance tonight? Can she move clearly ahead in a big state or two that Trump needs to win, like Florida, North Carolina, or Ohio? We wait for the answers. Still, we don’t think patience is required to make several ratings changes in the battle for the presidency and Congress, nearly all in favor of Republicans. The more competitive national environment means that some “reach” states for Democrats, namely Arizona and Georgia, are moving out of reach. Although the Clinton campaign once looked to these two red states as places to expand the map, Trump leads in both by two to five points in the polling averages. If the election result is close nationally, which certainly seems likely at this point, states that Mitt Romney won by nearly 10 points like Arizona and Georgia are unlikely to be winnable for a Democrat, even if Trump seems likelier than not to underperform the 2012 GOP nominee in each. The Crystal Ball has been somewhat skeptical of Clinton’s chances of winning either, even when her poll numbers were stronger in each: We never rated the two states as more competitive than Leans Republican. And now, given the electoral circumstances, we are moving both from Leans Republican to Likely Republican. The new ratings in these states don’t alter the overall Electoral College math, but 27 electoral votes are now more firmly in the GOP’s camp. As we shift Arizona and Georgia more toward the Republicans at the presidential level, we are also making similar moves in the states’ Senate contests. In the Grand Canyon State, Sen. John McCain (R-AZ) has so far weathered what looked to be a strong challenge from Rep. Ann Kirkpatrick (D, AZ-1). Summer surveys showed a relatively close contest, but more recent polls have shown substantial leads for McCain. This change, plus the fact that the top of the GOP ticket is on more solid footing, necessitates a ratings change: Arizona’s Senate race moves from Leans Republican to Likely Republican. In Georgia, Sen. Johnny Isakson (R-GA) always looked more secure than McCain, but there was at least some evidence that the incumbent could potentially find himself in a competitive race. But Isakson’s wide lead in the polls points to a comfortable win in November, so we’re shifting the Peach State’s Senate race from Likely Republican to Safe Republican. There is also good news for the GOP in the Iowa and Ohio Senate races. Iowa Democrats were always going to struggle to beat Sen. Chuck Grassley (R-IA), a long-time incumbent who has won at least 60% of the vote in every reelection bid. And with Trump now positioned as a slight favorite to win the Hawkeye State, there is no sign that Grassley is in any danger, moving the Iowa race from Likely Republican to Safe Republican. Meanwhile, the Buckeye State was supposed to be one of the key races in the battle for control of the Senate. And it appeared to have a first-tier competitive matchup between Sen. Rob Portman (R-OH) and ex-Gov. Ted Strickland (D). But Portman has taken advantage of a massive resource advantage to inundate Ohio’s airwaves and Strickland has largely flamed out as a candidate. In an age of relatively few ticket-splitters, it appears there could be a fair number of Ohioans who vote for both parties as Portman leads by double digits while Trump holds a narrow lead in the presidential race. The Buckeye State Senate race also moves from Likely Republican to Safe Republican. 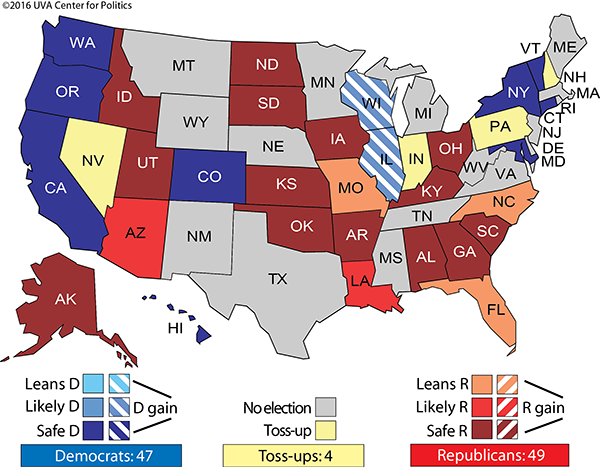 Democrats now have an even narrower path to taking back the Senate. With Wisconsin and Illinois likely to elect Democrats to the Senate instead of the incumbent Republicans, Democrats need three of four of the Crystal Ball’s current Toss-ups (Indiana, Nevada, New Hampshire, and Pennsylvania) to win an outright majority (or two of them and the vice presidency). Uphill battles in Leans Republican states such as Florida, Missouri, and North Carolina could also provide opportunities, but they remain harder targets (of the three, Florida is moving closer to Likely Republican, while Missouri and North Carolina seem to be getting more competitive). Just as Trump’s improvement has helped Republicans in the Senate, he also may be helping Republicans in the House, who are generally holding the line and may be able to limit their losses to single digits. We have five House ratings changes this week, with all but one favoring Republicans. That includes moving several races out of the Toss-up column. All of these races are still competitive, but we see an edge for one party over the other in them. Several recent polls have shown Rep. Mia Love (R, UT-4) improving her position against Doug Owens (D), her 2014 opponent. While Trump should underperform in this district — he is weak for a Republican amongst Mormons, a conservative voting bloc that dominates Utah — Love is in a good enough position to weather it. Trump may provide a lift to Rep. Bruce Poliquin (R, ME-2), another first-term representative facing a rematch from 2014 (in his case, against former Democratic state Sen. Emily Cain). Maine awards its electoral votes by congressional district, and poll after poll shows Trump leading in ME-2, a white, rural district (he’s up 8.5 points there in an average of four recent polls). Poliquin generally runs behind Trump in these polls, suggesting that Cain might be getting some crossover votes from some apparent Trump Democrats in the district, but Poliquin was up five and 10 points, respectively, in two recent public surveys. Rep. David Young (R, IA-3) occupies a swingy, Des Moines-based district that used to be held by long-serving moderate-conservative Rep. Tom Latham (R), who retired prior to 2014. Trump’s strength in Iowa may be buoying Young in a district that, even if it votes for Clinton, is perfectly comfortable backing Republicans for Congress. A few polls here, including a couple of Republican internals, have Young comfortably leading, and Democrats have not provided contradictory numbers. These three districts, ME-2, UT-4, and IA-3, move from Toss-up to Leans Republican. Additionally, the open CA-24, where Santa Barbara County Supervisor Salud Carbajal (D) is facing businessman Justin Fareed (R), is getting more competitive, and groups from both sides are slated to spend money there, according to Daily Kos Elections’ excellent House outside spending tracker. Carbajal is still favored in this district, which is a few points more Democratic than the nation, but it goes from Likely Democratic to Leans Democratic. The lone ratings change in favor of Democrats in this update comes in NY-3, an open seat held by the retiring Rep. Steve Israel (D). This is a very competitive seat on paper, but it’s also one that Clinton should be able to win, which likely would help former Nassau County Executive Tom Suozzi (D) against state Sen. Jack Martins (R). A bizarre court case could have led to an early October Republican primary and maybe even pushed the general election to December — where lower turnout would have almost certainly aided Martins — but the election is back on a regular calendar. We’re moving from Toss-up to a tentative Leans Democratic here. Our ratings changes this week leave just 12 Toss-ups, with 230 seats safe, likely, or leaning Republican and another 193 safe, likely, or leaning Democratic. Split the Toss-ups six to six, and one gets a 236-199 House, or a net gain of 11 seats for the Democrats. That’s still within the 10-to-15-seat net Democratic gain we’ve been projecting for months, but in our last couple of updates we’ve been slightly downgrading our projected Democratic House gains. Unless there is a dramatic reversal in the presidential race — a total collapse by Trump that at this point seems highly unlikely — the Democrats’ path to winning back the House majority, always just a small possibility, is nearly closed.